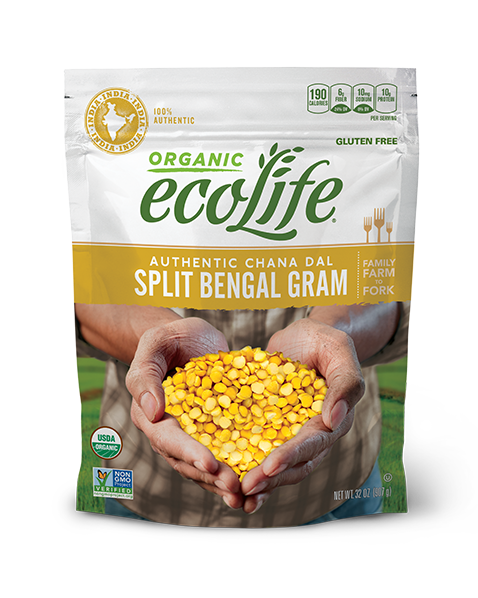 ecoLife® Organic Split Bengal Gram is authentically sourced from India, where it is the most popular legume used in dishes such as curries and vegetable stews. It is part of the chickpea family and has a low glycemic index value, making it a popular alternative to animal protein. Sort, rinse and drain before cooking. For added flavor, add a pinch of salt or other herbs and spices before cooking. To decrease cook time, soak for 1 hour and reduce simmer time by half. Combine 1 cup Split Bengal Gram and 3 cups water in a saucepan. Bring to a boil. Reduce heat to a simmer (medium-low to medium), cover and cook for 60-70 minutes. Add more water if necessary to keep the Split Bengal Gram submerged. When done, Split Bengal Gram should be tender and soft. Combine 1 cup Split Bengal Gram and 3 cups water. Never fill cooker more than half full. Skim off any foam or bubbles. Close cooker. Bring to pressure on high heat. Reduce heat to low, but keep under full pressure and cook for 15 minutes. Pressure cookers vary. Cooking times are approximate. Adjust cooking time as needed. Follow suggested instructions from pressure cooker manufacturer. © 2019 ecoLife. All Rights Reserved.